There’s certainly no shortage of services offering to help people connect online for professional reasons, and as of recently we can add eBackers to that particular line-up. 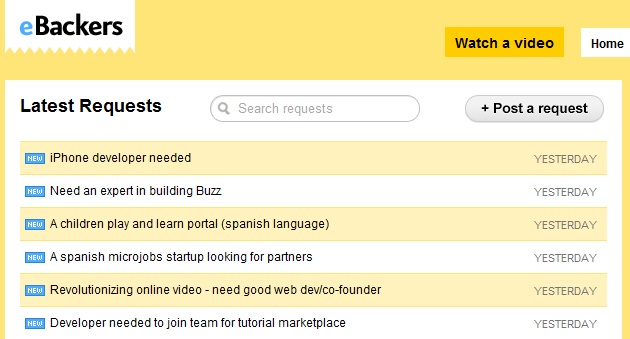 Dubbed a request board for savvy web workers, aims to become a place where web professionals, online businesses, startups and people with ideas gather on the Web, whether for securing funding, partnerships or merely advice. Currently, the board consists of a website owner looking for an iPhone app developer, the founder of an online video startup looking for a partner, and the like. eBackers is completely free and was founded by Marco Massaro, previously owner of Audiolizer.com, a streaming music service. Alternatives include PartnerUp, Build It With Me, Entrepreneur.com and Kickstarter.